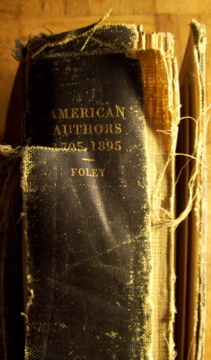 Chew believed Foley's work was not a bibliography, but was just another checklist of the works of American authors. 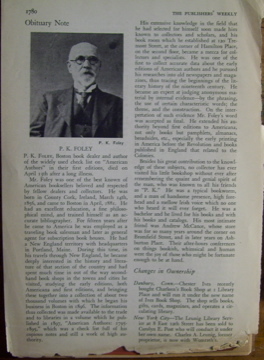 "A most serious defect," according to Chew was that Foley omitted the names of the publishers in the listings of the books. If that is the case, then the following works in my library by Merle Johnson, B.M. Fullerton, Jacob Blanck, and Wright Howes are not bibliographies either because they all committed this "most serious defect." To be truthful, Johnson did not classify his work as a bibliography in 1928. 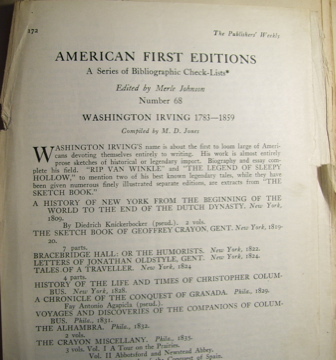 His title was American First Editions: Bibliographic Check Lists of the Works of One Hundred and Five American Authors. 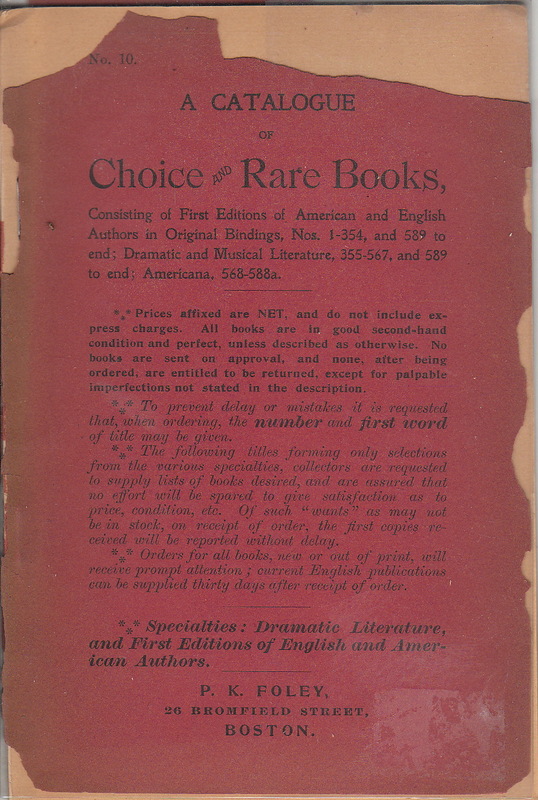 B.M Fullerton called his 1932 work a bibliography: Selective Bibliography of American Literature 1775-1900: A Brief Estimate of the More Important American Authors and a Description of Their Representative Works. 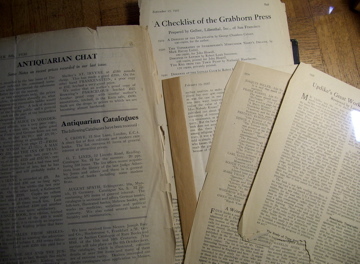 When Jacob Blanck revised Merle Johnson's work in 1935, he expanded it to include 199 authors, but also referred to it as a bibliographic checklist. 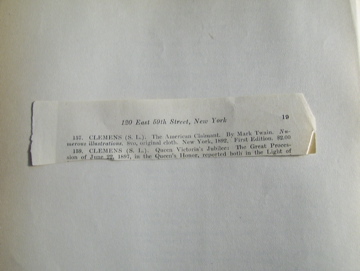 Blanck, too, omitted the names of the publishers. Then there is Wright Howes's book, first published in 1954 and revised and enlarged in 1962: U. S. I A N A (1650-1950): A Selective Bibliography in Which Are Described 11,620 Uncommon and Significant Books Relating to the Continental Portion of the United States. Even Joseph Sabin in the early volumes of the Dictionary of Books Relating to America omitted the names of the publishers. 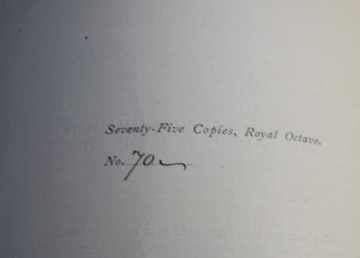 Wilberforce Eames, however, included the names of the publishers in later volumes. 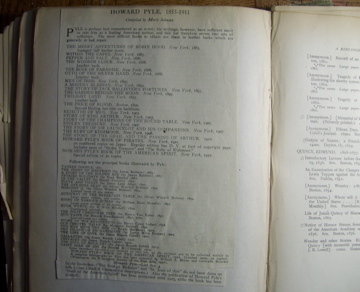 Regardless of Chew's classification, the Library of Congress lists all the above works under bibliography. And Foley's work too! 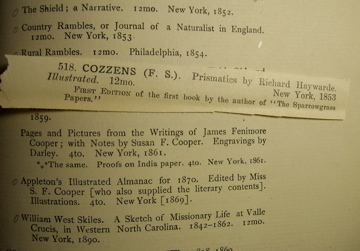 Even the Grolier Club itself lists Foley's work under bibliography! Unfortunately, Publishers' Weekly didn't do the same in its article announcing Foley's death. Foley's obituary begins, "P.K. 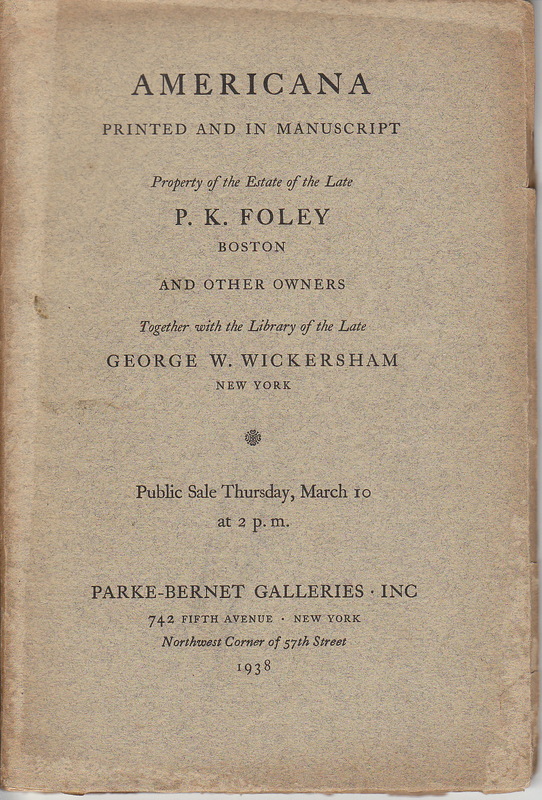 Foley, Boston book dealer and author of the widely used check list on 'American Authors' in their first editions, died on April 13th after a long illness..."
There is a great article about Philadelphia booksellers by George Allen that is part of Four Talks for Bibliophiles, Philadelphia, 1958, talks given at the Free Library of Philadelphia. 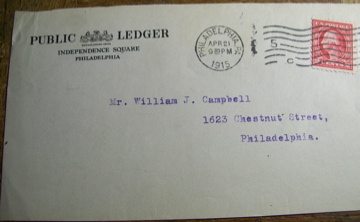 Allen recalls that the Campbell bookstore was the second oldest bookstore in Philadelphia. The firm was started by William J. Campbell's father, John Campbell in 1849. William J. Campbell was a physician, but gave up his practice and took over the bookstore when his father could no longer work. According to Allen, William J. Campbell specialized in Americana and Frankliniana, and even compiled a bibliography of Franklin's works. 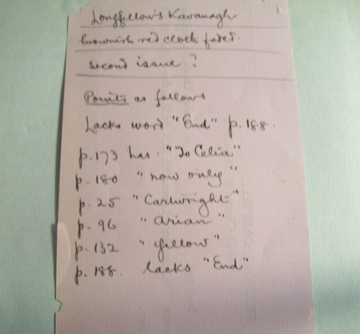 You will soon see that Campbell was quite interested in Longfellow as well. 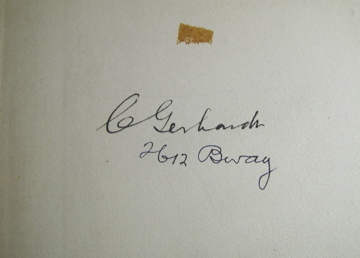 Gerhardt signed his name on one of the rear free endpapers. The address, I believe, is his home address, and not one of the several addresses where his bookstore was located. Both booksellers had a high regard for P.K. 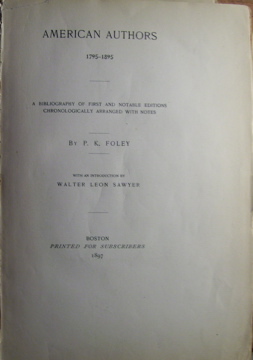 Foley, and referred to his work extensively. Foley was a Boston bookseller who gained his knowledge of American first editions with fifteen years of experience first as a traveling book salesman and then as the agent for subscription houses. He visited many a bookstore in his travels. His bibliography became a bible of sorts and provided a ready reference for himself and for his fellow booksellers. "Not in Foley" was a term used by more than a few booksellers in the early 1900s to identify a book that was not listed in Foley's bibliography. Besides having a copy of P.K. 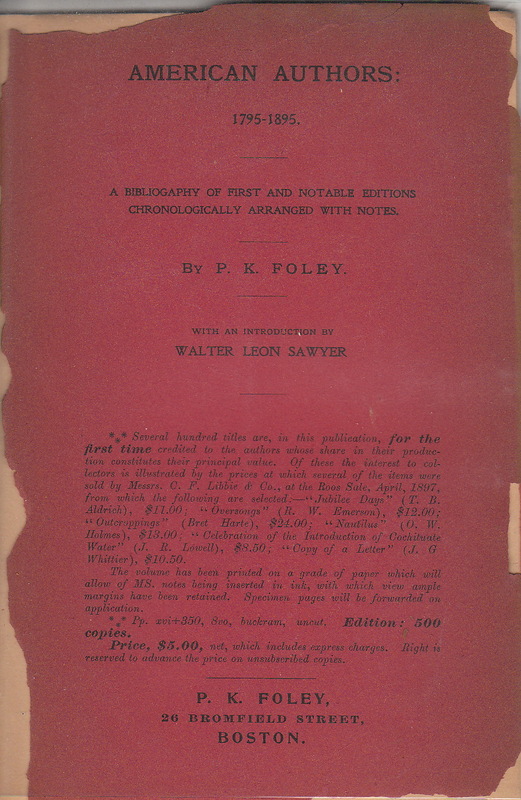 Foley's bibliography and a copy of one of his bookseller catalogues, I also have a copy of the auction catalogue of his library. 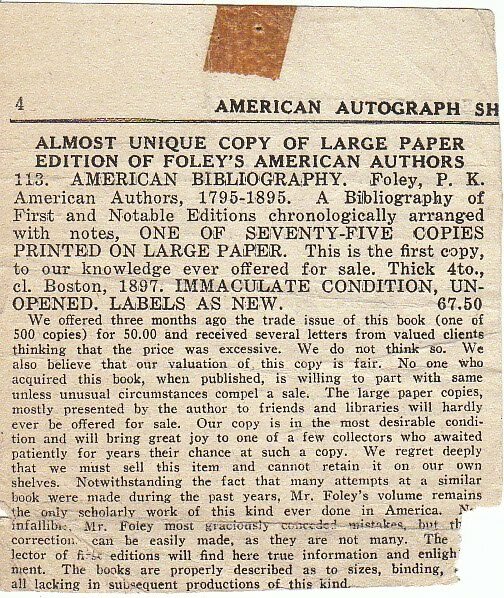 I like the listing of Foley's copy of his own bibliography:"... 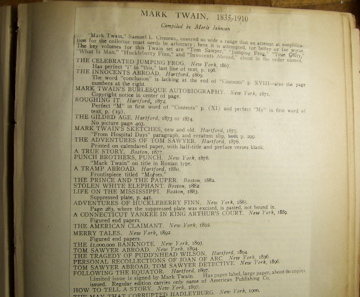 The volume is replete with clippings, manuscript, and other material relating to American authors." I've told you a little bit about Foley and a little bit about "Not in Foley." Now I will show you what is literally "In Foley." 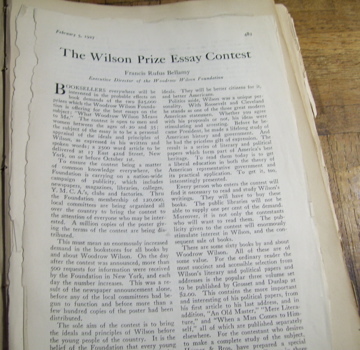 Foley's work is interleaved with blank pages to add additional notes and other material. 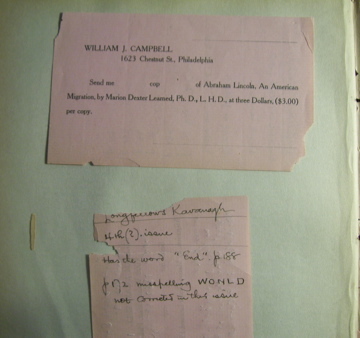 In Foley's bibliography, William J. Campbell loosely inserted notes on "points," particularly pertaining to Henry Wadsworth Longfellow. Christian Gerhardt, on the other hand, either inserted or pasted numerous – and I mean numerous – articles and "bibliographic checklists" from Publishers' Weekly. 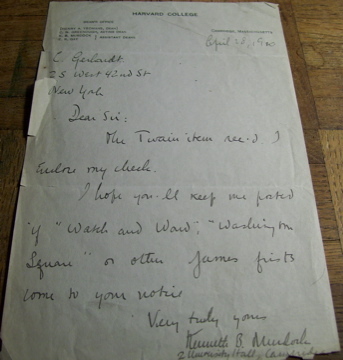 Gerhardt was still active in bookselling in 1949 when he was hospitalized for a serious ailment at the age of 83. At that time, AB Bookman's Weekly called him the "Dean of American Antiquarian Booksellers." 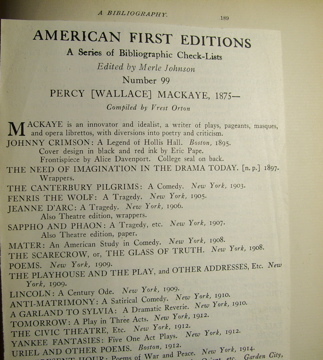 If Merle Johnson's name sounds familiar, it is because he published his bibliographic checklists in Publishers' Weekly before publishing them in a book. Gerhardt even loosely inserted clippings from catalogues, a practice which has added to a nightmare I am facing. 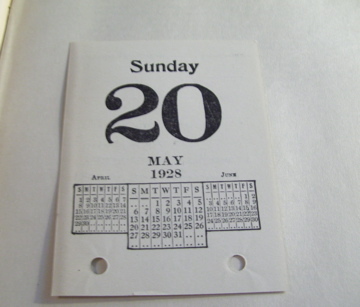 There are bibliographic notes on the other side of this calendar sheet. There are so many loose inserts that I have moved some of them to the back of the book for the time being. 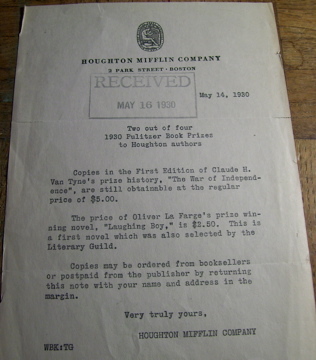 Below is a 1930 letter from Houghton Mifflin Company. The year 1930 is significant because that is the year Gerhardt went to the penitentiary for six months. 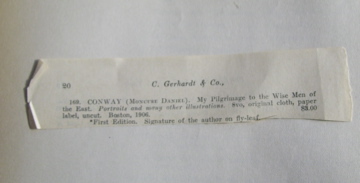 An undercover detective found a flyer for Flesh and Other Stories by Clement Wood in Gerhardt's bookstore. The flyer displayed an illustration of a bare-breasted woman with several strands of pubic hair in view. Gerhardt was convicted on obscenity charges. 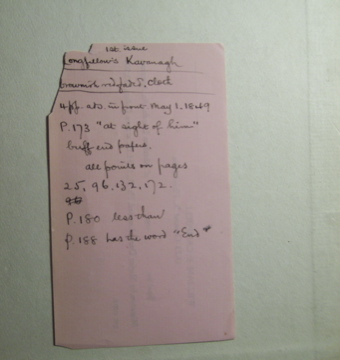 The letter, above, loosely inserted, is the last dated entry in the book. I know Gerhardt continued in the book business, but I don't know if he still had the book when he was released from prison. I bought the book on eBay in the early 2000s from a professional bookseller whose name I can't recall. The binding is in tatters. Some of the sections are loose. There are well over one hundred inserts. The book has been on my bookbinding pile for almost a decade. I need to rebind the book, but somehow keep the inserts where they are. I'm going to rebind this book in November. Wish me luck!